PRODUCT: 10" Diamter, PVC Roof / Deck Drain Kit. Rubber Connector fits 3" drain pipes. 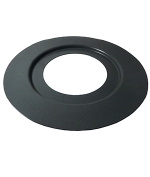 Complete with molded PVC body, epoxy coated cast aluminum alloy clamping ring with gravel stop, polyurethane dome, cast aluminum under deck clamp, rubber coupling, Hardware. Price/Kit. DESCRIPTION: The PVC Roof Drain kit includes the roof drain with a cast under-deck clamping ring and rubber connector with clamps. Drain construction is a molded ultraviolet stabilized 5" high polyethylene dome strainer, a 10.25" diameter epoxy coated cast aluminum gravel guard and clamping ring, an injection molded ultraviolet stabilized PVC drain body, a cast aluminum under-deck clamp, and a flexible rubber pipe connector with stainless steel clamps. Designed for roof drains when a clamping ring is needed to secure roofing membrane and create a watertight roof system. 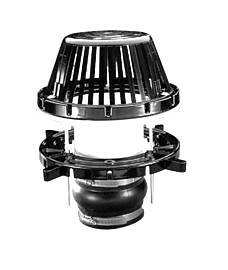 9.5" diameter x 5" high poyurethane strainer dome. 10" Cast Iron Drain Dome/Strainer. Kits WITHOUT underdeck clamp and rubber pipe connectors.